As the largest independent body of convenience store retailers and newsagents in Ireland, the single most important objective of The CSNA is to protect our interests. All help and advice is sought independently and delivered with integrity to our members. Should a situation arise where The CSNA may not possess the advice you require in-house, we will point you in the right direction so your query or issue will be dealt with by a recommended qualified professional or public service representative who specialises in that specific area. The help & advice offered by The CSNA includes, but is not limited to; employee rights, equality, health and safety, workplace relations and legislation. The CSNA acts in an advisory capacity to members and actively lobbies on your behalf. All queries, concerns and issues are listened to carefully and fully respected and all communication remains private under the instruction of the member. 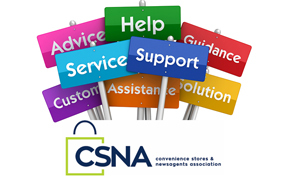 The CSNA strives to keep all members up to date with the latest news, information and advice. The ‘Show Me I.D – Be Age Ok’ youth access prevention programme has been developed by a range of trade organisations to provide Irish retailers with advice, support and leading practice on how to avoid the sale of age restricted products to minors. Downloadable materials available here include a refusals register in which you are encouraged to record all underage refusals, top ten tips for refusing minors and a poster for display in your back office. A great video if your looking for advice on Minimum Requirements on Holiday Entitlements. Use the SME Support Tool to see what supports are available to help your business grow. There are over 80 Government supports available to Irish start-ups and small businesses. The online tool will quickly help you discover which supports best fit your business. A new guide for retailers has been launched that aims to help them reduce their waste and environmental footprint. Entitled ‘Resource Efficiency for the Retail Sector’, the guide was launched by Green Business, in conjunction with the Environmental Protection Agency. In it, retailers can learn how to reduce their energy, water and waste bills, says James Hogan, programme manager with Green Business. “This is the essential ‘green bible’ for retailers of all types and sizes,” he adds. The guide calculates, for instance, that a hot water tap left running unnecessarily for 10 minutes per working-day hour can end up costing companies €6,000 per annum. Savings can also be made by switching to LED lighting and other energy-efficient devices. As Irish retail continues to struggle against the effects of declining sales, stagnant consumer demand and rising business costs, dedicated guidelines demonstrating how the retail industry can achieve significant savings by maximising the efficiency and sustainability of resources has never been so timely.